The Board of Trustees of the Beacon Academy wishes to announce that Mark Vincent L. Escaler has been appointed Head of School, taking over from OIC Ma. Elena P. Locsin. Mark will assume the post on 1 November 2013. Many in the Academy community have had a chance to meet with Mark over the last few months, and the Board and its Search Committee are convinced that he possesses the academic and philosophical core, curriculum experience, administrative skills, and personal qualities to take the Academy to the next level as the institution’s 3rd Headmaster. For six years between 2004 and 2013, Mark served as the Chairman of the Department of Communications at Ateneo de Manila University where he has held a faculty position since 1991, actively teaching in both the Departments of Communication and the Department of Philosophy. Concurrently within that span, he served as a Director of the Eugenio Lopez Jr. Center for Multimedia Communication (2010 – 2013), Director of the Center for Communication Research and Training (2000 – 2001, and 2009 – 2010), and Director for e-Learning of the Konrad Adenauer Asian Center for Journalism (2001 – 2005). As a professional Consultant, Lecturer, and Curriculum Developer, Mark has worked with diverse and multi-sectoral organizations that include The Philippine Commission on Higher Education (CHED), Cemex Philippines, Inc., Newsbreak Philippines, the Lopez Group Foundation, the Inquirer Group of Companies, the Philippine Daily Inquirer, Baker and McKenzie, United Laboratories, Inc., Westmont Pharmaceuticals, Inc., University of Asia and the Pacific, LVN Pictures, Inc., and the World Health Organization. 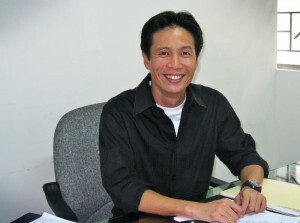 Mark earned his BA (Major in Philosophy) from College of Arts and Sciences, Ateneo de Manila University in 1990. He received his MA from the Gallatin School of Individualized Study, New York University in 1997, focusing on Postmodern Philosophy and Film/Media Studies. Mark’s penetrating involvement in disciplines as wide-ranging as communication theory, philosophy, film studies, art, media, popular culture, technology, journalism, tertiary education, and creative innovation is an indication of a deeply committed core, an active mind, and engaged action for informed cultural change. Many in the Beacon Community who know and have met him found a remarkable resonance between the areas toward which he directs his energies and the Academy’s own vision for the kind of formative education it hopes to instill in its students. In Mark’s own words: “This range of interests is unified by my belief in the value of a liberal arts education, the ‘interdisciplinarity’ of teaching and learning, and the way in which the critical and creative thinking skills that form the basis of these fields are the most important tools for navigating, appreciating and succeeding in an increasingly unpredictable world”. The Board of Trustees and its Search Committee wish to thank the students, parents, faculty, and staff for their invaluable participation and feedback during the search process. With great confidence and highest expectation, we look forward to the coming years and the challenges set before the Beacon Academy to fulfill its promise of a superlative and urgently relevant education. Please join the Trustees in extending a warm welcome to Mark Escaler.